Generally speaking, a more dense plant stand allows the crop to compete better with weeds. After a certain point, however, the benefits of an increased plant population do not outweigh the cost of additional seed, especially when seed cost is high. For example, a study in Alberta found that increasing canola seeding rate beyond 150 seeds/m2 reduced profitability of the system (Upadhyay, 2006). In certain cases, however, a high seeding rate may allow farmers to eliminate in-crop herbicide or reduce herbicide rates. Increased seeding rates can also affect other aspects of crop production. High seeding rates have been shown to reduce fleabeetle damage to canola (Dosdall and Stevenson, 2005) and lower root maggot infestations, so higher canola seeding rates can be an advantage (Dosdall et al., 2004). On the other hand, a more dense stand may increase susceptibility to sclerotinia (Dosdall et al., 2004). Thus there are tradeoffs which must be considered in deciding on a seeding rate. Studies in Alberta looked at the relationship between crop seeding rate and the effects of reducing herbicide rates for weed control. Increasing barley and canola seeding rates allowed for good control of wild oat, wild mustard, and wild buckwheat with one-half to three-quarters the registered herbicide doses, without sacrificing crop yield and without allowing weeds to produce large numbers of seeds. Using reduced herbicide rates resulted in higher net returns for barley, but not for canola (O’Donovan et al., 2001, 2004). Other research on barley has also shown that a higher seeding rate increases the crop’s ability to compete with weeds. In one study, a higher barley seeding rate (280 plants/m2 vs. 160) reduced wild oat seedling survival, biomass production and seed production (Scursoni et al., 1999). In another study, researchers in Saskatchewan found that a high barley seeding rate (150 kg/ha) reduced wild oat biomass production, and tended to suppress wild mustard as well ( Kirkland, 1993). An Alberta study found that wild oat caused less yield loss in barley when higher seeding rates were used, and suggested that seeding barley at relatively high rates could reduce the need for wild oat control with herbicides (O’Donovan et al., 1999). The same trend has also been observed in wheat, even though wheat is not as competitive with weeds as barley. Research in Montana showed that increasing spring wheat seeding rate from 175 plants/m2 to 280 plants/m2 increased wheat yield by 12% (Stougaard and Xue, 2004), reduced wild oat biomass and seed production by 20% (Xue and Stougaard, 2002) and increased economic returns (Stougaard and Xue, 2005). Research also shows that increasing seeding rate may help oats compete with weeds, especially wild oat. In a study involving eighteen field experiments at six locations in western Manitoba and eastern Saskatchewan, oats were seeded at various rates, with target plant densities ranging from 14 to 42 plants/ft2. 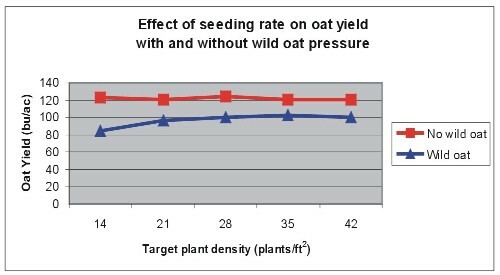 In experiments where there was no pressure from wild oats, tame oats were able to compensate for low seeding rates, and oat yield was not affected. As shown in the following graph, all five seeding rates resulted in virtually the same oat yield, just over 120 bu/ac. The picture was very different when wild oats were present. The lowest seeding rate (14 plants/ft2) resulted in a yield of 84 bu/ac. Increasing the target plant density to 21 plants/ft2 increased oat yield to 97 bu/ac. However, increasing seeding rate even further (28, 35 and 42 plants/ft2) did not result in corresponding yield increases (see graph at left). Yield peaked at around 100 bu/ac, well below the yield obtained where there was no wild oat pressure (Bill May, personal communication). There is considerable evidence that narrower row spacing combined with a higher seeding rate can work together to reduce overall weed competition. Some studies have shown that very narrow row spacings (4 inches) or planting in a uniform grid can maximize yield of cereal crops at higher seeding rates (Kirkland, 1993; Weiner et al., 2001). That said, seeding rate appears to be a more important factor than row spacing. Thus, it should be possible to continue to use low disturbance direct seeding without adding more openers. Since disturbance may increase the numbers of weeds and increase the persistence of weed seeds in the seedbank, some openers may be counterproductive (see also Tillage System). Seeding in paired rows may be a way of increasing the seedbed utilization without requiring more openers on seeding equipment; however, the impact of paired rows has not yet been determined. Manipulating row spacing in crops that are generally planted as row crops (corn, soybeans, dry beans) also has potential to affect weed control. Research on dry bean in Alberta has shown that reducing row spacing to 8 inches and increasing plant density to 50 pl/m2 (from 20) increased bean yield and resulted in better weed control, allowing for the use of reduced herbicide rates (Blackshaw et al., 2000). However, these narrow rows have been shown to more susceptible to white mould. High seeding rates generally increase the crops’ ability to compete with weeds up to a certain point. However, the high seeding rate may not always result in a higher economic return, especially when seed costs are high. With competitive crops such as barley, high seeding rates may eliminate the need for in-crop herbicides. With other crops, high seeding rates may allow farmers to adopt practices such as reduced herbicide rates (see Reduced Herbicide Rates). Blackshaw, R.E., L.J. Molnar, H.-H. Muendel, G. Saindon and X. Li. 2000. Intergration of cropping practices and herbicides improves weed management in dry bean (Phaseolus vulgaris). Weed Technol. 14: 327-336. Dosdall,L.M. and F.C. Stevenson. 2005. Managing flea beetles (Phyllotreta spp.) (Coleoptera: Chrysomelidae) in canola with seeding date, plant density, and seed treatment. Agron. J. 97:1570-1578. Dosdall,L.M., G.W. Clayton, K.N. Harker, J.T. O’Donvovan and F.C. Stevenson. 2004. The effects of soil fertility and other agronomic factors on infestations of root maggots in canola. Agron J. 96:1306-1313. Kirkland, K.J. 1993. Weed management in spring barley (Hordeum vulgare) in the absence of herbicides. J. Sustainable Agriculture 3:95-104. O’Donovan, J.T., K.N. Harker, G.W. Clayton, J.C. Newman, D. Robinson and L.M. Hall. 2001. 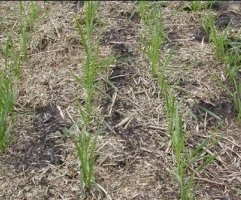 Barley seeding rate influences the effects of variable herbicides rates on wild oat. Weed Sci. 49:746-754. O’Donovan, J.T. J.C. Newman, K.N. Harker, R.E. Blackshaw and D.W. McAndrew. 1999. Effect of barley plant density on wild oat interference, shoot biomass and seed yield under zero tillage. Can. J. Plant Sci. 79:655-662. O’Donovan, J.T. J.C. Newman, K.N. Harker and G.W. Clayton. 2004. Crop seeding rate influences the performance of variable herbicide rates in a canola-barley-canola rotation. Weed Technol. 18:733-741. Scursoni, J., R. Benech-Arnold and H. Hirchoren. 1999. Demography of wild oat in barley crops: Effect of crop, sowing rate, and herbicide treatment. Agron. J. 91:478-485. Upadhyay, B.M., E.G. Smith, G.W. Clayton, K.N. Harker and R.E. Blackshaw. 2006. Economics of integrated weed management in herbicide-resistant canola. Weed Sci. 54:138-147. Weiner, J., H.-W. Griepentrog and L. Kristensen. 2001. Suppression of weeds by spring wheat Triticum aestivum increases with crop density and spatial uniformity. J. Applied Ecol. 38:784-790.